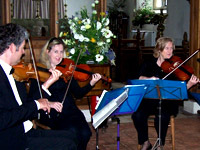 " We had a fabulous day and the quartet playing made it extra special"
Based in East Anglia and specialising in a sparkling repertoire of light, popular and classical music, the vivacious Champagne String Quartet is ideal for weddings, receptions, banquets, parties, corporate events, private and public concerts and all social occasions. Drawing on a stable of top professional musicians, Champagne is available from solo, duo, trio, quartet, quintet through to full string orchestra. 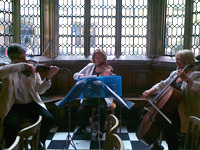 Whether you're looking for a traditional string quartet or something slightly different - we have the perfect musical accompaniment to any event. To get a feel for what Champagne Strings can offer for your event please visit our repertoire and gallery pages, or you can see some examples of the Champagne Strings in action by visiting our video channel. If you're looking for additional services which may be of benefit to your event, please feel free to visit some of the associated companies we have worked closely with in the past. Champagne Strings can provide the underscoring to your event with pricing based on the travelling distance, amount of time required and number of musicians booked. For a quotation or if you wish to make further enquiries please do not hesitate to contact us. 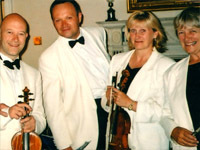 Additional examples of the repertoire performed by the Champagne Quartet are available on our demo CD. We also have a CD of suitable music for wedding ceremonies which is available upon confirmation of your booking.